The opening moments of “Stream of Consciousness”are disorienting. Awash in reverb, as in an empty warehouse or a bounded public square, Maria Radich’s vocals mingle with those of an audience of unknown size. Camera shutters click, men cough into their sleeves, children test their own small voices against Radich’s echoes. It’s unclear: has the performance begun? But soon other instruments can be heard, a few at a time, the texture thickening as the 26-strong band materializes. 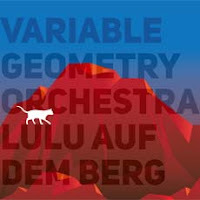 Lulu auf dem Berg (“Lulu on the mountain”—a clever allusion to Alban Berg’s unfinished opera) is the third release from Ernesto Rodrigues’ Variable Geometry Orchestra. Membership is variable, too: the group can swell to as many as 40 musicians, and always features some familiar names from the Portugal scene. Here we find Miguel Mira, Hernâni Faustino, and Sei Miguel, among others. Free improvisation is tricky with large groups. Perhaps ironically, adopting the minimalist, textural approach of electroacoustic improvisationis often a fruitful strategy. Rodrigues deftly moves his musicians through a droning series of dark, shifting shapes, the variable geometry of a flock of birds, turning on his whim. Over the course of the nearly 50 minute performance, there are a few moments of more “traditional” free improvisation, but the intense reverb in the playing space smears everything, effacing even the attack of each drum hit. It may be due to my recent listening, but the murky start and brooding progression brings to mind the music of Jakob Ullman. Not so much his use of extreme quiet, but the idea of holding music at a distance to elicit a form of strained listening. Attention is sustained not by following a melodic trail or the clash of counterpoint, but instead by pushing to get closer to the details, immersed in the flux of a slow-moving, all-pervasive mass of sound. Rodrigues has used the word “subliminal” in the past when talking about this music. Indeed, a session with Lulu auf dem Berg feels like something that was slowly absorbed rather than actively engaged. Moody, suspenseful—even cinematic—music. Highly recommended.